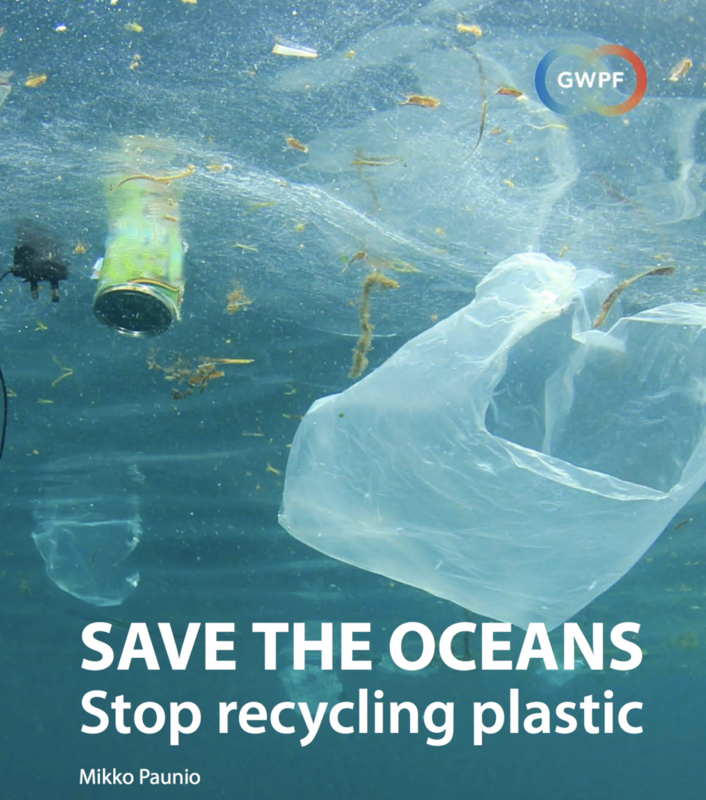 SHOCKER: RECYCLING PLASTIC IS MAKING OCEAN LITTER WORSE | Watts Up With That? From the GWPF and the “Great Pacific Recycling Patch” department. June 28, 2018 in Oceans. This is the result of finding a single boogeyman—CO2—and refusing to look in any other direction. Progressives don’t care about the environment or children or immigrants or gender etc they just need tools/a boogeyman to gain more power. Like a cancer their goal is to grow but don’t understand that it will eventually kill the body. There are NO good cancers. Most products nowadays are considered consumables and are not made either to be repaired or easily recycled. This extends to even very large and expensive items, the mindset behind this has come from manufacturers who see a route to increased profit from selling an endless stream of new goods that only have a limited lifespan, why mend your car when the parts cost almost as much as it is worth? Governments don’t help by pushing more and more unnecessary regulation of a non problem CO2 while ignoring some very big problems. As I keep saying the bureaucrats are only happy if the box is ticked not if anything has been done or not, if you can show you have a system in place to deal with the problem that’s good enough doesn’t matter if it works or not as long as you have a system. Many UK councils collect “recycling in the full knowledge that it will end in landfill but knowing that if they have collected it as recycling they will get payed by the government. While working at an environmental agency a new regime came in who tried to implement a system of measurable results/ goals for every program. The blow back from staff, especially longer serving middle management, was profoundly amazing. They did everything possible to thwart any such system and at least three different systems were tried over a decade. When finally forced to do by changing the personnel rules, many managers, all with degrees in environmental science, could not define measurable goals for the programs they had supposedly run for years. What I find disturbing is that many environmental problems, real environmental problems, are not being addressed, e.g., nutrient pollution in estuaries and bays but the environmentalists are now focused on CO2. Many of these “minor” problems proven solutions and compared to “fixing” CAGW are cheap. I am not denying the point, but this shows a good picture for the developed countries and nutrients are essential just like carbon dioxide. Some rivers and estuaries are nutrient poor, pig sty types not as common as they once were; the estuarine thing is complex, popular view way behind the literature. Several of us would publish on this but don’t want to go through the nonsense especially given no climate/crisis link. And guess what we don’t know or don’t know that we don’t know. (“…an area 44 ± 15% larger than previous spatial estimates.”) Water creeps around, we just had a foot of it come down, lots of misunderstanding around (44 ± 15%???). I’m not sure that it got anywhere but I once did some follow-up work on National Marine Fisheries recommendations for COE permits. This is a very necessary practice, but wonder how much is really done, some I know of worthless. Dear James, The right wasy to deal with plastics is to burn the=m under pressure so that the flue gas can be sequestered underground, that takes car of all the vapors, and any metal that gets blended in with the feed, will be collected and recycled properly. We have developed a pressurized combustor that is estimated by a third party estimator to be less expensive than a conventional boiler. That is all that I can sasy about the combustor until we get the patent filed. Yep, we have completely ignored real pollutants while being distracted by the CO2 scam. Not true. Burning brings its own problems – dioxin release into the atmosphere, toxic ash, … Clearly these problems can be resolved, and several countries have done so, but this involves building expensive high-tec installations and separated waste collection systems. Not all countries / governments are willing to make such investments and set up the necessary organization. WRONG. recycling is loosely related to CO2, only because both are ways to care about environment. Recycling always looks like a good idea ; whether it actually is, much depends on the value of the thing. Looks like it isn’t, for plastic. The sheer waste of trying to clean products intended to be disposable, like food wrap, is certainly more than any benefit from trying to recycle the product. Absolute virtue signalling. Liberals seems to be ground zero for unintended consequences ……..
because whilst being driven by their own selfish incentives (which they mistake for virtue) they think other people’s selfish incentives are simply evil. Just burn all the used plastic up, and let the trees recycle it. They will get it done. To be fair, I think we have all fallen foul of this unintentionally. It’s like someone said on WUWT once, ‘if the solution seems simple, it isn’t’. Recycling seems a noble quest, why wouldn’t it? Until this sort of detail, that’s deliberately concealed from us by our governments, is exposed by a scientist. An honourable Greenpeace scientist (is there such a thing?) might have broken ranks and said something similar, but what profit would there be in that for an organisation with mankind as it’s principle enemy. What sense is there in vilifying nuclear energy by slandering it with a reputation for danger, when, in reality, it’s demonstrably the safest means of electricity generation ever conceived by man. Unless, of course, there’s an ulterior motive. So we sift our waste like dutiful citizens, only to find it’s transported offshore, to be dumped in a river on the other side of the world, and we still carry the can. My hair shirt has worn very thin over the past few years. As much as it pains me, I have for some years no longer bothered to itemise my waste. It all goes in the same bin, and now, my beliefs have been justified. The greens have a price to pay for their naive simplicity. It’s called ritual humiliation. The opportunity is coming soon, but there will be few to humiliate, they will all have scurried back to their rat holes. Your friends and relatives will all say they agreed with you, despite them having fought tooth and nail against you. But we can all bask in the glory of having stuck to our scientifically sound beliefs. We may not be 100% right, but I’m damn sure we’re much righter (is there such an expression?) than our alarmist brethren. I am not disagreeing with anything you write but no part of the discussion has yet focused on the overuse of plastic. it very much has its uses but it is overused. Piles of plastic are stuffed in public waste bins or ion our recycling bins. Food wrap and bubble wrap by the acre is regularly discarded. THE single most stupid plastic waste is from the insane plastic wrapping used on pallets of anything! so they went to ones that rot into shreds and scatter fine debris all over within months outside. OR stored in any light at all. bloody useless if you want to keep something in a shed for a year or so. the polyprop also slide when moved, as do the tough plastics for dog food /soil/ manure etc. i cant find any way to reuse it at all and im damned determined to recycle anything i can at home or elsewhere, just because i hate waste and wasted money. Too simple as well I am afraid. Lots of research has shown that the production of jute is hugely damaging to the environment, just as cotton has destroyed the irreplaceable Aral Sea. Single use plastic bags are actually resource-light, and many people re-use them. In various places where single-use bags were banned, the sales of bin liners simply increased by the same amount. And the big, strong multiple use bags use far more resources and need to last for ten years or so to be less damaging overall than single use bags. Yes – the few plastic bags we get in shopping become garbage bin liners (and are cheaper than the bought ones). When you are throwing wet waste away, you really DO need to line your bin. (BTW, did you know that the word ‘crud’ defined the icky coating that developed inside one of the old galvanised dustbins?) And as far as re-usable bags go – mine are made from recycled cloth-like material that isn’t washable. Result – only packaged goods go into them – anything else has to go into fresh bags to avoid contamination. Well, Patrick Moore comes pretty close although I’m not sure of his scientific qualifications. Patrick Moore has a Ph.D. in ecology, so he is a scientist. His correct title is Dr Patrick Moore. I have a huge amount of respect for him. Since posting my first comment to you I have been for a walk before it gets too hot. I observed piles of plastic waste in public bins and piles of clear plastic bags in which there was other plastic items, together with plastic overwrap and bubble wrap. How much could have been avoided with a little thought and how much was better than the alternative? Never heard of the stuff. Sounds revolting and not something any self respecting Scotsman would eat. “The difference between Smoked Scottish Salmon and Scottish smoked salmon. I suspect salmon jerky falls into the category of salmon from elsewhere passed off as coming from Scotland. My question is how is plastic recycled is it melted down or shredded or what? I just can not comprehend why the US and Europe can not do their own recycling. I think the real issue is to do with the need to sort the material BY HAND. These hands are much cheaper in certain countries so that is where the stuff goes. As labour costs rise in these countries the amount of recycling is reduced significantly or it may even escape into the environment. “…escape into the environment” Gosh you’re so diplomatic! It sounds like the stuff that’s too tough to separate just gets dumped. We’re talking China and Asia after all! Yes, interesting observation. however if recycling is as profitable (or as worthwhile) as is claimed I would have thought that machines could do this unpleasant job. “machines could do this” Recycling should become profitable. We now have the self learning robots thanks to someone at MIT. That turns labor cost into fixed and maintenance cost. It’s the sorting, different types of plastic can’t be recycled together. I’m not aware of any technology to automatically identify and sort various polymers prior to grinding, remelting and making new pellets. Incineration really would be the most economical and smartest. We have a local company that specializes in making garbage/recycling material conveyor systems. They are working on automating the sorting but are still having issues with training the vision system to reliably identify between different types of materials. Not an easy task if you’ve ever worked with vision systems just due to the sheer variety of packaging, position in which it is presented to the camera and condition of the packaging. This all makes it hard to properly train a system that manufacturers themselves don’t run into. This why they are still using cheap labor to hand sort. Melting and shredding use electrical power and “clean, renewable” electric power is too expensive, as South Australia (40% wind!!) finds out. we could….use gas if we werent selling most of it cheap to china n japan i guess? It should be properly burnt, with all the correct controls and the heat used to make electricity and or supply heating. Instead they cut down forests and burn those instead. milk containers etc can be melted in a home oven and used to form solid tubes you can then shape to make rollers shims etc from. It is impossible as I wrote in my report to recycle plastic as at source, bring sites or in mechanical and biological treatment (MBT) plants sorted plastic is non-homogenous and filthy. It is only an environmentalists’ very expensive (to us) dream. Well, well, you’ve asked the $10 million dollar question! First we should not talk about recycling. It should be “recycling.” Or so-called-recycling. Conspicuously drop that bottle in the bin (people are watching! )–at work, on the street, at home–and others see that you “recycle,” and are good, and virtuous, and green. In the fevered imaginations of the Green Cult, that bottle is magically whisked off to some sort of “recycling” processing plant (I saw it on Sesame Street–it must be true!). At the “recycling” operation, the bottle is processed and pops out at the other end as something new! Magic! I’m a good person! Virtuous! Green! The bottle is collected by a fume spewing diesel truck. The truck dumps the bottle at a facility that separates the “recycle” trash–pulling out aluminum, and other actually recyclable materials. The rest? Dirty, wet, contaminated plastic is pretty much worthless, and impossible to “recycle” at any cost. So? The bottle you “recycled” is now bundled up with other useless “recycled” trash. The bundles are loaded onto shipping containers. The shipping containers are trucked to a port. The containers are loaded onto ships. The ships burn fossil fuel to get to China. The containers are off-loaded. The containers are loaded onto trucks. The trucks take the containers to landfills. The containers full of bales of “recycled” plastic are dumped into the Chinese landfill. So, your conspicuous act of Green devotion fills a landfill. Yes, the landfill is not in your backyard–it’s in China! My company uses mostly recycled milk jugs to make its product. While the jugs are initially “Dirty, wet contaminated plastic” it is washed and turned into plastic pellets all right here in the US and Canada before being shipped (by rail) to our plant. Better yet, the PCR(post consumer recycled) plastic we use cost less than virgin plastic. Even better, the end product itself can be recycled. I do agree it’s insane to ship off our recycled material to Asia. If there isn’t a market for it here I doubt there’s a market for it in Asia. Take care of disposing the material where environmental regs are better. That’s fantastic! And that’s real recycling. And it makes economic sense. If we let the market work, and don’t impose insane “green” rules that allow the PC-Progs to demonstrate what good people they are, but destroy the environment, then real recycling will carry on as it used to (economically viable material will be pulled out of the garbage and reused/recycled. How do you remove the milk jugs from the waste stream? And separate them from the “recycled” mixed materials? That’s a quite energy/work/labor intensive operation isn’t it? Never confuse a liberal with new facts. They are stuck on the idea that recycling is the perfect policy and don’t care that it is not working like is supposed to. They did their part and could careless it is all screwed up downstream of them. There is more plastic to be recycled than is need for recycled plastic. Plastic is not like metal which can be melted down, it is molecules going through chemical reactions. Metals are basically frozen mixtures of atoms which can be melted and resolidified. Atoms are the basic building blocks of the crystal structures in useful metals, casting and forging temperatures do not harm atoms – recycling is not harmful. The. Basic building blocks of plastics are molecules of various lengths. Processing temperatures, solar radiation, weathering, chemical exposure all can damage the molecules. If the molecule is changed the plastic is changed. Some(most??) manufacturers mix virgin plastic with recycled plastic – just using recycled plastic leads to lower quality product. Burn it. Its the obvious solution. Yep …. think of the GWs of electricity we could generate with all that plastic in the pacific. Mix it in with some coal, and be done with it. This, plus heat and save the Forests at the same time. Or bury it, and you can say that you are sequestring carbon. Cheaper and safer than pumping CO2 into the ground, and therefore less silly. Or ground up to use in 3d printers. Virtually all waste save metal and ash can be reduced to methanol, and then used as an oil-product substitute to make anything you like. There are those proposing such a methanol economy as the answer to all junk. Food, plastic, fabrics, everything can be reduced easily to methanol. Because it is such a flexible input material, and can be pumped, it is worth considering. Garbage separation is just inert v.s. carbon-based. “The EU is trying to redouble recycling efforts and to close down the incineration route, mistakenly believing that this will reduce carbon emissions.” According to Dr.Paunio, annually over 10 million metric tons of plastic litter end up to oceans. Incineration of this amount will produce 30-35 Mt of CO2. In 2012, CO2 emission from burning fossil fuels and producing cement was about 35 gigatons, i.e. one thousand times greater. It makes sense, at least compare the cost of recycling and incineration processes. The energy cost of recycling generally exceeds the energy saved. I am almost completely skeptical about where all the carefully sorted stuff at the local tip ends up. Landfill taxes and legislation against incineration makes waste disposals ludicrously expensive. Supermarkets now do not give away plastic bags in the UK. Yet my plastic bin is overflowing – not with supermarket bags, but with supermarket PACKAGING. My meat is wrapped in two layers of polythene. So is my fish. My vegetables get put in poly bags too, for weighing., Or come in prepackaged cellophane packaging. My milk comes in a polythene bottle. So do my cooking oils and my soft drinks. My coffee beans and tea bags come in sealed plastic bags. Any delicatessen items come in little plastic tubs, as does margarine. I would say that the weekly shop contains around 200g of plastic of which about 5g used to be the supermarket shopping bag. It took me HALF AN HOUR to get a set of lawnmower blades out of their packaging. Seriously, what is the POINT of ‘marketing’ lawnmower blades, in plastic packing? Do I go to the supermarket and select one over another based on packaging? I have mild arthritis, and not enough sound teeth to tear open most vacforms. Even with scissors is not usually obvious where to attack it. If people were really serious about plastics, they would simply ban them from all packaging and make people use cardboard instead. And they would simply BURN the plastic to get some energy out of it. I doubt that is generally true, just sometimes. If the produce produced (methanol) it can be used directly to create heat or rotary power needed to process the material. There is a huge amount of energy in things like plastic and tires. Incinerating waste for electricity solves how many problems? Good thing we have Democrats to prevent these things. The mythical island made of plastic that floats on the Pacific. Does it have a name? If not, I named it Solyndra. In Sweden almost all waste is incinerated to produce area heating and electricity. But oddly enough the plants prefer imported waste from e. g. UK or Italy to the domestic variety. A friend in the plastic industry was paid handsomely by government to recycle household plastic waste. The end objective is to turn plastic back into the pellets or “nurdles” from which it came. In the course of this, vast quantities of microgranules are created. These are the little plastic thingies that are apparently found in the living tissue of every creature on earth. Surprise. In Australia, the supermarkets have taken it upon themselves to ban so called free single use shopping bags, to be replaced with much larger 15 cent re-usable plastic plastic bags which will take up a lot more space at the tip. I can’t see myself re using any of them due to convenience and health issues. So the problem just gets worse. Green lunacy. Australian governments have been talking about the supermarket bag problem since at least 2010. And no federal laws passed that I know of. + When are the masses of ocean-going plastic going to be being addressed? Wait long enough and it becomes a global, nano-particle soup and impossible to deal with. I live in a liberal mecca that decries using our forest for anything but to hike in. This community was at the fore front of trying to stop the use of paper bags for “the trees” and using plastic bags instead. Now we can’t use plastic shopping bags because they are worse than paper ones according to our elected masters. unexpected, so interesting. But obviously makes sense. I recycle as much as possible, including plastic. I now have to think about it. Good as recycling is nonsense. Greenies want us to concentrate postconsumer waste although it is a tiny proportion of material flows in a modern society. For example in Finland we produce 100 million tons of trash but only 2.5 million tons in post consumer real. Greenies are trying to be alchemists with this 2.5 million tons of municipal waste. Nobody but crowny capitalists gain from this nonsense. Plastic is simply non-recyclable for reasons I explain there earlier. Thanks for the interesting research you’ve done. What do you think about the economics of pulling out the aluminium, ferrous metals and/or glass before incinerating this stuff…is it cost effective or is it better to try and recover the metals from the ash later on? Why not just clean up the rivers before they reach the ocean. Surely we can find the technology and surely wealthy nations can afford to support the effort. This is why we need many pictures, video, and documentaries on the massive waste around these river outlets in Africa and south Asia. You practically have to go there currently to get the story …and the smell. It actually makes pretty god fuel. After all it is really just congealed oil. The answer to the age-old philosophical question – why are we here? Plastics axxholes! I just cannot fathom how I managed to survive childhood when we were restricted to glass, brown paper and waxed paper containers for nearly everything… oh, and tinned cans as well. Glass is eminently recyclable… excepting those bottles that have deposit (and impressive two cents (US) when I was a kid… we’d scour the neighborhood collecting bottles to get deposit money for penny candy). Beverage companies would wash & sterilize the bottles and refill, or send the damaged/unusable bottles to the bottle manufacturer for recycling. Paper sacks were re-used when shopping, or for collecting kitchen trash. “Fast food” and all other forms of food carry-out were sold in paper, waxed paper, or (waxed) paper cartons. Twine and tape secured packages. Crumpled newsprint – and sometimes (unsalted/unbuttered) popcorn — was used as packing material. The horrors! I’m amazed my siblings and I survived. Is the real story here another third-world environmental scam? EU countries seem to be paying to “inject huge quantities of waste into Asian waste management streams” only to have them dumped into different oceans. Like “carbon offsets”, this looks like EU virtue signaling becoming a cash bonanza for third-world fraudsters. It’s hilarious that the EU, the bastion of enviro-fascism, can’t think of a better idea for recycling than shipping it to southeast asia and pretending it will all turn out ok. Anybody that has visited southeast asia, such as Thailand or Vietnam, will know that the US has zero to do with ocean pollution. It’s hard to believe the EU was naive to this fact. 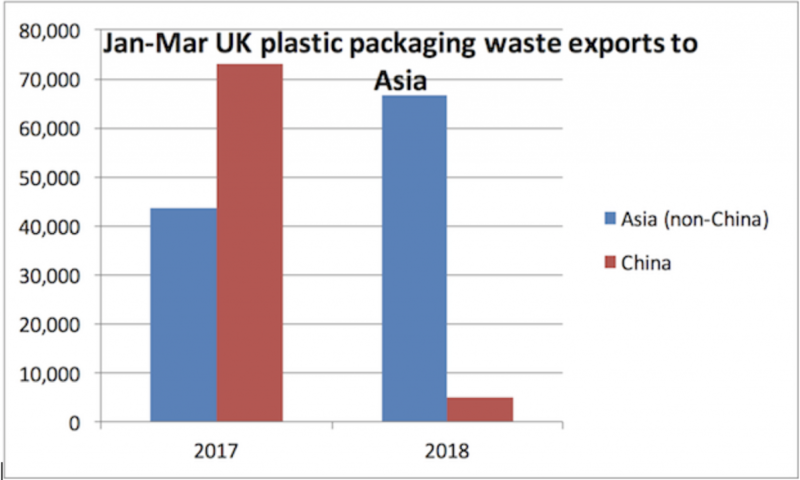 What is the west going to do with all their plastic now that China has stopped importing it? They have enough of their own now so …. In the reduce, reuse, recycle scenarios it is only the first one that matters. The other 2 are for appearances only and after the fact kludges to the waste problem. Plasma incinerators are a great invention. Mine the waste for what you can extract profitably and torch the rest. Even low level radioactive material from hospitals can be safely made inert in that process. Burn it for heavens sake! The plant in the image below (Gärstadverken) produces nearly all heating for a city of 130,000 inhabitants (1.4 TWh thermal) plus 300 GWh of electricity per year. All from waste – 88 tons per hour at full blast in winter. Sailing around the world in their plastic yacht with plastic sails and plastic ropes to warn us of the dangers of plastic. ““Razor-sharp fiberglass shards flew 800 meters,” the Westfalen Blatt reported. Lets hope they look after those turbine offshore??? And fiberglass composites are really difficult to dispose of. They can’t be recycled or burned, are virtually indestructible, non-biodegradable and last virtually for ever. The only large rocket I know that “used tanks” was the German V-2. Just about the first improvement both americans and russians thought of was to eliminate the tanks and use the rocket structure as an integral tank. So unless they find some way to eliminate the rocket structure completely nothing will be gained. And making electric engines and/or generators out of a non-conducting material will definitely need some way-out-of-the-box thinking. Please contemplate this cut-away image of the Saturn V. It’s a bit of a challenge to store liquid hydrogen and oxygen without some sort of tank and insulation. Of course, the later Space Shuttle had solid rocket boosters that would have been more reliable had the rocket bodies not been shipped in sections. And the external tank, complete with insulation that would have been more reliable if it stuck to the tank better, had, umm, two tanks inside, as mixing liquid hydrogen and liquid oxygen is best done in rocket engines and not premixed in the tank. What we have here is a conflict between an ethic of ideal ends (“recycle!”) and an ethic of responsibility (“does it work?”). May I refer you to Adam Minter,s work? He details the recycling of plastic and other rubbish in China. They made new plastic items . Containers were sent from New Zealand by firms who collect recycling because they got a good price for it. China now prefers to use it,s own plastic rubbish in the main he claims. Non ferrous metals are still much in demand,as they always have been in other countries. He writes in Bloomberg and has written books including one called Junk Planet. ,People have made fortunes in recycling even old time rag and bone men who drove carts through British Streets. Councils sell off the rights to recycling collections in New Zealand. There,s money in recycling.